I understand you may not want to reveal this, but could you maybe tell us the country the gloves are being manufactured in? ooouuuooooo its like the good ol days... the excitement!!! Hopefully I generate some cash for the slush fund but I should be in depending on price point. Made in Japan with C55 comparable leather. This just became "can't wait to see examples" serious! be posted on the website. Pics? I went to the website and didn't find any. You are waiting until they are available for sale? At least give us a look. 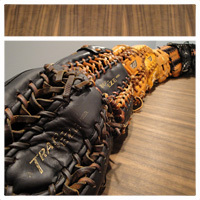 Would love to see a remake of the some of the rawlings revolutions. Will you have trouble using the gloveworks name being that the other company of the same name exists?